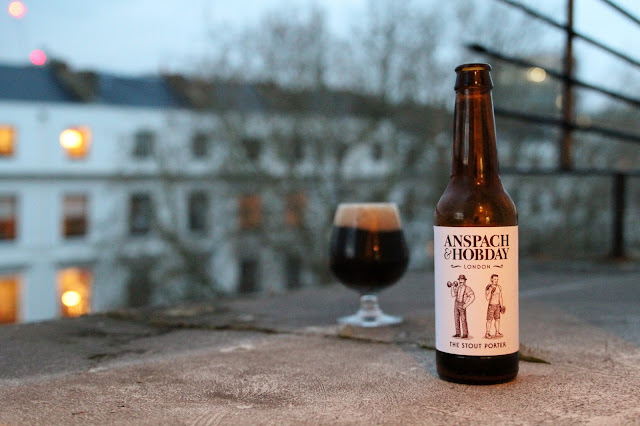 If I were to give a Most Improved Award to any one London brewery for the past few years, I would almost certainly give it to Anspach & Hobday. It's not that they started from a low base, though. It's just that they have kept plugging away across a broad range of styles (much broader than most breweries in the Big Smoke, it is worth noting), and they have now brewed highly accomplished examples of, amongst many others, double IPA, tripel, saison, barrel-aged beers, rauchbier and Belgian ale. But one area where A&H have thrived since Day 1 is with their dark beers. Perhaps the best example is their [The] Porter, which ranks in the top 50 for its style on Ratebeer.com (amongst more than 11,600 entries for the style). The A&H Stout Porter is also excellent. I bought a bottle from the brewery when it was first released back in October 2014. I ended up aging the beer, and just opened it tonight. I am overjoyed to say that the beer has matured gracefully, and it now nothing short of world-class. This original bottling pours oily black with a dense, frothy beige head that settles into a long-lasting cream. The aroma is enticing, with prominent notes of charred wood, cocoa, dried and leathery dark fruits, faint tangy berries and some earthy hops. The flavour is medium sweet, with richly layered chocolate character, bittersweet baking cocoa, old leather, more burnt wood, scorched earth, aged berries and hints of raisins. It is full bodied, lightly chewy, with fine carbonation. The beer finishes with moderate alcohol warmth, more rich and bittersweet dark chocolate, strong roasted malts, torched wood, burnt toffee, dried dark fruits. It is somewhat drying in the aftertaste, with a light tannic quality about it. Overall, the level of complexity here is superb. While A&H have improved on many fronts, their dark beers have always been stellar, and this beer is a testament to that. Well done.